You can find me on Facebook these days, for updates on what I'm writing and what I'm doing. Susan Bartholomew (M), Jacey Bedford, Aliette de Bodard, Kari Sperring, Sarah Walters. British Fantasy until her untimely death in May 2015. Aliette de Bodard was born in the USA, and grew up in London and Paris, where she now lives and works. and the Hugo-nominated novella On a Red Station, Drifting (2012). The House of Shattered Wings, a BSFA Award nominee this year. Kari Sperring (M), Aliette de Bodard. fanwork set in the past. Fiction Criticism with world-renowned critics, academics and authors. session. There is a limit of ten participants. I'm one of the guests of honour at this year's Picocon (which is number 32), alongside three great writers -- Frances Hardinge, Ian MacDonald and Cory Doctorow., at Imperial College, London. I'm delighted to be asked -- it's the second time I'm been one of their guests and I'm glad I was interesting enough last time that they wanted me back. It's one of my favourite cons: it's run by the members of the Imperial College Science Fiction and Fantasy Society, who are mostly students and they put on wonderfully imaginative, entertaining programmes. I came up through student sf societies and university-based cons, and going to Picocon is like going back to my roots. I'm been invited to be Guest of Honour at Novacon 44, in Nottingham on 14 - 16 November at the Park Inn Nottingham. It's a real honour and I'm delighted to have been asked. as more than just a 'popular' writer in the last quarter century or so. Carter already), Justina Robson, Judith Tarr and Zenna Henderson. A quiet year so far: no that that's a bad thing! I shall be heading up to Glasgow to attend this year's Eastercon, Satellite 4. Hope to see some of you there! lost much of yesterday to a migraine and thus am behind. Bah. and fuchsia flippy; beautiful batik beaded (by request of the marquis). Aidan Harte, Helen Marshall (mod. ), Sophia McDougall, Mark Charan Newton, Tim Powers, Kari Sperring. I haven't decided exactly what to read yet. Any suggestions? So, yesterday I decided to indulge in another round of that intermittent habit, poking the internet with a stick, but starting a hashtag -- #womentoread -- over on Twitter. I asked people to recommend sff by women. The response was astonishing: I'd hoped that some of my friends would pick it up, but... One of the very first to do so was Seanan Mcguire (Thank you, Seanan!) and it just took off. All afternoon (my timezone) and well into the evening, people were naming their favourites, exchanging names and recommendations and ideas. It was huge fun and the enthusiasm and engagement and excitement was just wonderful. I am profoundly grateful to everyone who joined in and help this happen. Towards the end of the day (my time) writer Harry Connolly (gave me the idea of capitalising on all this momentum by linking it to a series of blogposts about specific women writers and post links to these pieces on twitter using the hashtag. (You can read Harry's article here I've written about women writers whose work I love before, of course, but the problem has been that relatively few people saw them -- mainly my existing social circle and readers. And that is a key issue for many women writers: underexposure. But the hashtag, as I said, has some momentum, so this seems like an opportunity to try and raise the profile of writing by women and to address that underexposure to some degree. But why now, exactly. I've done something like this before (last year with the fantasy by women thing). That's part of it. I am an activist to my bones: it's coded into me to try and do something when I see an injustice. And I know far too many really great women writers who are underrated, under-reviewed, under-recognised. I see male writers praised for doing things in books which women did before them, which women are doing as well as them -- but the women are ignored and sidelined. It is a fact that books by women are reviewed less frequently than books by men, and that prestigious review locales pay less attention to women than men. This year's review survey came out two days ago. During the day, my twitter feed was full of men -- many of them high-profile and influential -- decrying the under-representation of women writers in reviews (and I am very glad to see them recognising this and commenting on it) but immediately going back to talking about, promoting and praising works by other men. Last week, my friend and fellow writer Juliet E McKenna found ourselves in a major branch of a major UK book-chain in Oxford and noticed a promo table for fantasy. We're both fantasy authors, we took a look. The theme was clearly 'If you like George R R Martin, try this". It was a table about 4 foot x 4 foot square, piled high with fantasy. Great. Except... all but three of the writers represented were men. And of the remaining 3 -- the women -- two were not epic fantasy writers but established Big Name Bestsellers -- Stephenie Meyer and Suzanne Collins and the books by them on that table were both sf. That's fine. I love sf by women. But those two books -- The Host and The Hunger Games weren't there because they were 'like' A Game of Thrones; they were there because they're already bestsellers in a related field. The other women present was an epic fantasy author and a good one -- Robin Hobb. Who has a gender-neutral name. I'm not saying the men on that table aren't good: there were some excellent books there, by excellent writers. There were also books by men I've never heard of, which are quite probably also excellent books. But the overall impression was 'This is A Man's World'. Jules and I started making a list of who was not on that table, of women who are epic fantasy writers and published in the UK. That was in about a minute. Now, you can argue, very reasonably, that some of those women are out-of-print here (but you might like to think about how they came to fall out of print in this context, given that contracts depend on sales, sales depend on exposure -- and women do not get the exposure). A table that censored women from a genre. A twitter feed that decried a wrong -- and then went back to the male default. You can see some of the responses and recommendations here. You can find more by going to twitter and hunting for the hashtag #womentoread. You can share the idea. You can write a review of a book by a woman. You can blog about a woman writer you admire. You can post a list of links to the websites of women writers you love. It doesn't have to be ep;ic fantasy or even sff. It can be any genre. And then, please, go to twitter and tweet that link with the #womentoread hashtag. If you're not on twitter, post the link here in the comments and I will tweet it for you. This isn't about me. I know how it can look, I'm a fantasy writer. But really, it isn't. This is about all those fantastic women writers whose books I've treasured for years, about Tanith Lee and Evangeline Walton, Judith Tarr and Kate Elliott, Anne Gay, Storm Constantine, Sherwood Smith, Rumer Godden, Juliet McKenna, Barabar Michaels, Elizabeth Goudge, Liz WIlliams, Dion Fortune, Sheila Gilluly, R A McAvoy, Barbara Hambly, Leah Bobet, Sarah Monette, Justina Robson, Amanda Downum, Claudia J Edwards, Sharan Newman, Freda Warrington, Stephanie Saulter, Lisanne Norman, Jaine Fenn... I could go on and one and on. Some of those writers are long-established, some are out of print and out of contract, some are new, some are dead. But they are all great. And me? Later today I'll be blogging here and on my livejournal blog about a woman whose books were a lightning bolt to my writing world, Nancy Springer. Eastercon (EightSquared Con http://www.eightsquaredcon.org/web/Welcome.html) is almost upon us, and this year I'm on the organising committee. So I am expecting a very busy weekend. I will be around for all of it -- I'll be the blur of speed in black and white -- but hopefully there will also be time for catching up with people and even sleeping. And to see our wonderful guests of honour, Walter Jon Williams, Freda Warrington, Anne Sudworth and Professor Edward James. I shall be at World Fantasy con in Toronto this weekend (1st-4th Nov). I have one panel, on Faith and Fantasy, at 9 a.m. on Friday and otherwise will be round and about the place. It's my first trip to Toronto, and I'm very much looking forward to it! Only one more week until worldcon! I am really looking forward to it. I don't get to worldcons very often and I always have a blast at them. And this year it's in Chicago, which is one of my favourite US cities. Come and watch me write Sadly, there will be no cats helping. Come and have breakfast with me! Adam "The Shark" Selzer, Bryan Thomas Schmidt, Emma Newman, Fabio Fernandes, Gene Wolfe, George R. R. Martin, Kari Sperring. Stross' blog. Charlie has very kindly let me loose on his readership. Today, we're talking about the histories of the Celtic and Gaelic speaking peoples. Come by and join in! And it's publication day! 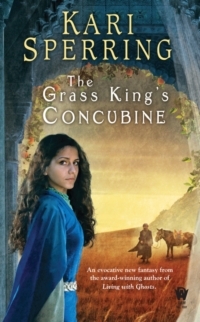 The Grass King's Concubine is out, and hopefully available from all good book outlets. To celebrate, I am giving away ten copies today via Goodreads between now and 8th September.